지난 11월 1일 성공적으로 메인넷을 런칭한 EOSIO 기반의 금융 로컬 체인인 WORBLI에서 현재 WBI 토큰 세일을 진행하고 있습니다. WORBLI 블록 프로듀서 중 하나인 ChainRift EOS의 도움을 받아 판매가 진행되고 있으며, WBI 토큰에 관심 있으신 분들은 ChainRift 거래소에 가입을 하신 후 정상적으로 구매가 가능합니다. 자세한 내용은 다음과 같습니다. 기타 궁금한 사항은 아래의 링크를 참고해 주시기 바랍니다. 감사합니다. 다음은 WORBLI 토큰 세일과 관련된 공식 발표 원문입니다. With our network up and running and our user account not far away, we’ve experienced quite a large increase in demand for our WBI tokens! Developers and members of our community are keen to get their hands on our token so that they can jump right in and begin using and building on our fully operational blockchain with over 30 block producers! The WBI token is a true utility token, representing and needed to access the resources within the WORBLI ecosystem. In order to cater to this demand and to celebrate our launch and achievements this far, we have decided to hold a token sale with the help of one of our block producers, ChainRift EOS. 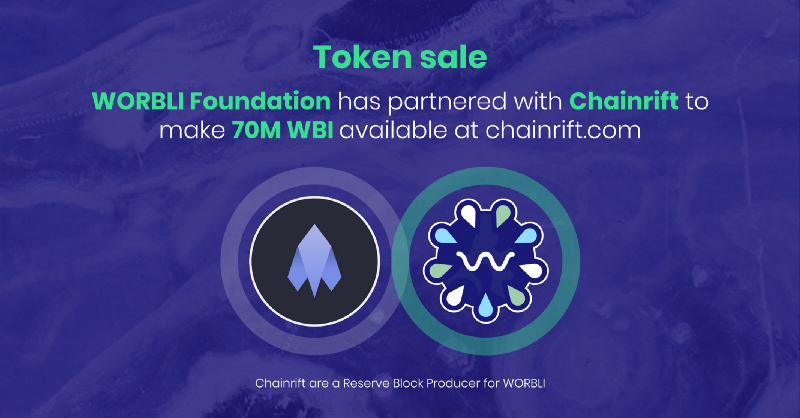 Via their ChainRift exchange, this sale will occur over a period of a few days, where we plan on offering 70 million of our native WBI utility tokens. When did the sale start? The sale started on the 15th of November, 9pm US east coast time, with individuals who submitted our “register your interest” form being granted a slightly earlier access. Where will the sale be held? What will the sale involve? You will need to register and log in to your ChainRift exchange account in order to access the sale. You will be able to see the current price of the WBI tokens and purchase them at this level. You will also be able to store your tokens within ChainRift exchange platform and you’ll be able to withdraw these into your personal WORBLI user account when we launch this feature on the 28th of November. This is a fantastic opportunity to jump right in and grab yourself some WBI utility tokens to be used on our incredible network. We hope you are just as excited as us, so save the date and don’t miss out! If you have any questions regarding the sale (or anything else for that matter), don’t hesitate to ask us in our telegram channel. If you have any questions about ChainRift, you can visit their support page by clicking on the following link.